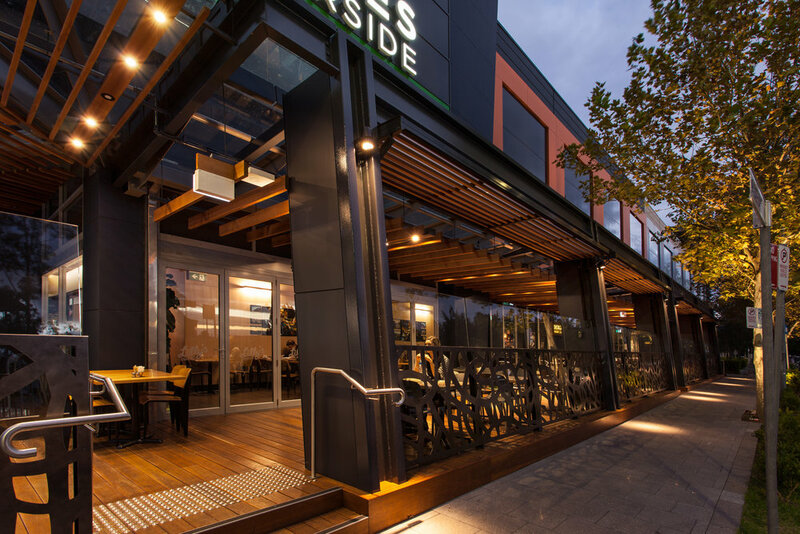 The street presentation of the Rhodes Waterside retail centre has been transformed with a new look and dining precinct. Along with the resulting commercial gains, the design team also ensured the project benefited the wider neighbourhood. Rhodes Waterside is an established retail centre in Sydney. The centre is set in a developed urban setting and shares its main access road, Rider Boulevard, with high-density medium-rise residential apartment complexes. The design team was tasked with developing a new image for the centre at its primary street entry on the Boulevard through a re-invention of the façade and main entry statement. The project also included designing an extension to incorporate a new restaurant and, most importantly, an alfresco dining precinct. The main entry, flanked by an existing run-down vertical sign structure, was re-skinned and re-branded. It is juxtaposed with the new, bold façade treatment which combines orange paint and black film on existing glass surfaces. Complementary additional embellishments applied to the buildings between the north and south ends of the site provide visual consistency and complete the dramatic makeover of the street presence for Rhodes Waterside. A new linear dining precinct has been created to the front of the centre, transforming what had previously been a bland and uninteresting façade. Notably, consent for this extension was granted to allow this substantial structure to be sited entirely on land outside the site boundaries. Working closely with the local Council, the design team was able to obtain approval for this unusual situation as the extension would contribute to the activity along the street. A new circular restaurant was also designed for the northern end of the site, nestled among the large mature palm trees in the street. Access to the upper retail and dining levels has also been significantly improved by adding a new lift adjacent to this restaurant. With residential apartments located very close to Rhodes Waterside, the design team devised a solution which would provide weather protection for the centre’s patrons, as well as resolving any potential acoustic issues for nearby residents. Rather than the commonly-used option of plastic pull-down blinds, the design team developed an adjustable façade of glass and multi-walled polycarbonate. This used vertical folding doors which, when retracted, formed a small projecting canopy. Once lowered into place, these doors made an acoustic and weather seal over the glass balustrade. This effectively resolved both issues of noise and weather protection. As well as allowing openness on sunny days, the height of the glass balustrade (1.8 metres) ensured it also provided wind protection and all hatches could be ‘battened-down’ during inclement weather. Even when enclosed, this use of glazing ensures seated patrons can still ‘see and be seen’ along the street.